With January being summer school holidays over here we knew we wanted to go somewhere, but where to go? Melbourne is nicely positioned right across the Bass Strait from Tasmania, a place I really hadn’t ever thought much of visiting. Tassie, as it is universally and affectionately called over here is an island state in Australia known for its rugged landscape, sparse population and of course Tasmanian devils. You have probably heard me complain about the weather in Melbourne a few times and Tassie being further south is even cooler making January a very ideal month to visit (remember January is one of the hottest months down under). My parents lent us their caravan (pop top trailer) which we used for the first week of our roadtrip and then once we met up with them, we moved into our tent. 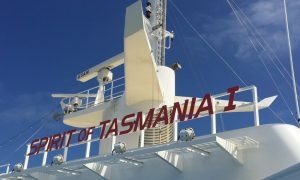 We could have taken a simple one hour flight across to Tassie, but we opted to take the Spirit of Tasmania ship because we wanted to bring our car (and caravan) and because our kids have always begged to go on a cruise. I am not sure it met their cruise ship criteria, not having a pool and icerinks and only being a 9 hour trip, but it was a great way to cross the Bass Strait. The Bass Strait known to be a rough passage as the warm waters of the Indian ocean meet the Pacific through this narrow and shallow strait. We definitely felt the motion of the boat and everyone was pretty happy they had taken sea sickness tablets. Read out Tips Taking the Spirit of Tasmania with kids here. You truly could spend weeks exploring Tasmania, but unfortunately we only had 11 days so we had to keep up a quick pace to see some of the highlights of the island. Cradle Mountain is one of those highlights and we were so glad it made it onto our itinerary. We only wishes we could have spent more than one night there and that it didn’t rain most of the time we were there. The Discovery campground there is lovely and even though it was pouring with rain and very cool (12 degree highs), it was wonderful to have a chalet building with a wood burning stove, a camp kitchen and travelers from all over the world to hang out with. Late in the afternoon there was a break in the rain and I herded the family into the car to visit Dove Lake. The popular Dove Lake circuit where you walk around the Lake taking in the sight of Cradle Mountain when the mist clears was our destination. The hike was a 6km hike and we had to finish before 7pm when the last National Park shuttle leaves the Lake. Since we were starting at 4:30pm and since we have three not always enthusiastic hikers, we challenged them to finish the hike in 2 hours. The lingering threat of having to spend the night at the Lake was motivation for them and they did great at keeping to the “2 hour pace”. The terrain in Cradle Mountain-Lake St Claire National Park is really unique and even though I haven’t seen Lord of the Rings (set in NZ I know), it is what I imagined the scenery would look like. We even got to see some wombats after our hike. We would have loved to some of the other great hikes in the area, but the next morning was raining again and so we headed on. We did visit the Interpretation Centre in the Park which is always a great way to throw in some environmental and science education. When the clouds move away, there she is. Tassie is well known for its fabulous produce and food. On our drive to Cradle Mountain we did stop to sample some local foods highlighted in the Cradle to Coast Tasting Trail. We enjoyed the chocolates at Anvers Chocolates, tasted delicious cheeses at Ashgrove Cheese, sampled some yummy craft beer at 7 Sheds Brewery and visited the 41 Degrees South Salmon Farm. Driving around Tassie takes longer than you anticipate because many of the roads are small and windy. Our kids have a tolerance of about 3 hours in the car before they (and us) start to go batty. After leaving Cradle Mountain, we made our way to Launceston, the second largest city in Tassie. We wanted to break up the drive and wanted to visit the beautiful Cataract Gorge. We stayed at the Big 4 campground, which always excites the kids with the jumping pillow, playgrounds and other kids to play with. In the late 1800s, someone had the foresight to create this beautiful park around this breathtaking Gorge with walking trails, a large swimming pool, restaurants and even a chairlift across the water. As Canadians, we have been on just a few chairlifts, so I couldn’t talk Paul into shelling out $50 for our family to ride one here. We walked the circuits around the Gorge and the kids even got a little wet in the freezing waters of the pool. We only had one night in Launceston, but with more time we would have loved to explore the City Park and the Tamar Valley wineries nearby. This was one of the places I was really eager to visit. It is a little more out of the way to get to and you have to be fairly self sufficient to camp in the area, but it has gained quite a bit of attention recently as one of the most beautiful places in Australia. The unique orange covered boulders that litter the coast shine against the white sand beaches and turquoise waters, making for a photographer’s dream. We couldn’t take enough photos of this beautiful place which for us reminded us of a cross between the North Channel of Lake Huron and the blue waters of the Bahamas. 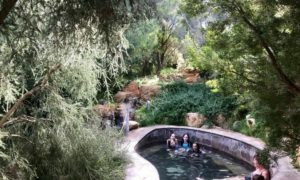 The kids spent hours climbing the big boulders, finding secret passages through the rocks, and exploring the tidal pools. The temperature of the ocean is certainly not the Bahamas though and we never really made it into the water. We did see many people brave the water, mostly in wetsuits (a must if you live here). We stayed at Cozy Corner South campground, which is a basic free camping area. There are some beautiful sites to set up overlooking the beach. This is a popular area and since people can stay free for up to 4 weeks, it can be hard to get one of those prime sites. There area a couple of drop toilets, but you need to bring in your own water and take out your waste. We spent our time here relaxing on the beach, exploring the boulders and having campfires. The kids love their smores although is hard to find full size American marshmallows. The have these smaller ones here that come in white and pink and are covered in powder. Indulging in the most delicious cherries and strawberries. We even tried to make a damper (bannock/bread on fire) with limited success. Along with Cradle Mountain, this is one of the big highlights of Tassie. The coast continues to be beautiful further south with beautiful cliffs into the ocean and rocky boulders littering the beaches. Since this is such a popular place, we weren’t able to get a campsite at the Big 4 or in Freycinet National Park, so we opted for a free campsite just outside the park, River & Rock. We did the hike up to the Wineglass Bay viewpoint and it is a very impressive view. 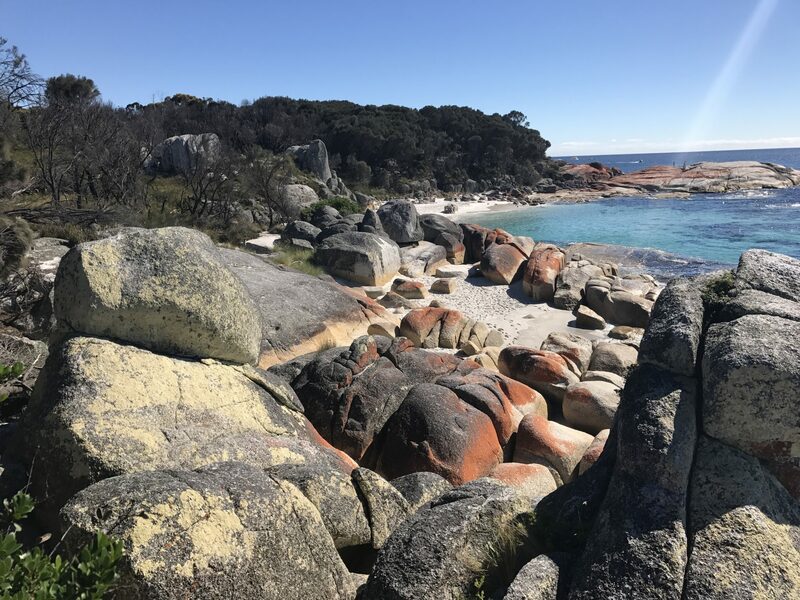 We were coming off the highs of our time at the Bay of Fires and so while we were impressed, we missed the crowd free time we had there. I would have loved to have hiked down to Wineglass Bay, but Miles’ feet were all torn up from the past couple days climbing barefoot over the rocks and so we headed back down to the car instead. It was quite chilly and windy while we were there so we didn’t get a chance to visit some of the beaches in the area, but instead opted to hike near Sleepy Bay. The kids enjoyed climbing all over the rocks here and the views were pretty great as well. From here we needed to head further south to rendezvous with my parents and my Aunt Patti and we will save the next few stops for Part 2. Find Part 2 of our Tasmanian Roadtrip here. Love this post. Looks like you all had a real adventure -shame about all the rain. Enjoy Melbourne! Tassie is really great. Hopefully you can get there soon while the weather is still nice…I am sure Tassie is nice in its own way in July, but it is nice to have some sun! Your photos are so beautiful! 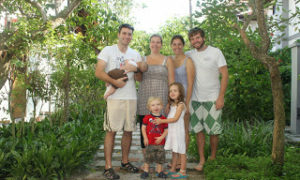 It looks like your family has a lot of fun! I didn’t really know much about Tasmania until reading this so I really enjoyed learning more about it. Thanks so much for sharing! Great guide! This looks like such a fun place to visit as a family!! Looking forward to the next article. We did “bread on a stick” in Canada last year.. I remembered it from my childhood and haven’t done it since then.. was SO much fun! I think Tassie is definitely worth a visit. It reminded me of NZ a bit and was so pristine. 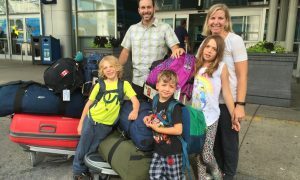 What fun to be planning your RTW trip – I plan those all the time in my head. Tasmania is such a beautiful place, I hope one day I will have the opportunity to see all these beautiful places! Love seeing what “Tasmania” really looks like. The natural beauty is quite outstanding. The Bay of Fires, would be at the top of my list. I do like the sound of the local food and chocolate tours as well. It looks like there is much more to discover in Tasmania than I thought. Thanks for sharing! !